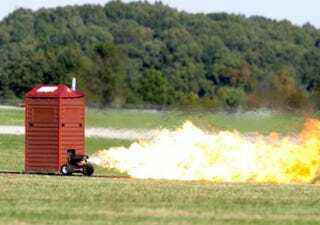 An Indianapolis-based company with too much time on its hands attached a 750-pound Boeing jet engine to a portable toilet, making it capable of reaching speeds up to 70 miles per hour. We know we've seen this one before — it was built by Paul Stender, the same guy who did this jet-powered school bus (we even mention the jet-powered outhouse in that story). Be that as it may, it's a pretty epic shot up top from the Telegraph. We can't ignore it. Just like we can't ignore this video we've plopped below.